EZ-Ox® granules and briquettes are "flowable" and sink such that they can be poured directly in boreholes or PRBs via gravity without the need for expensive or messy slurry-preparation and injection equipment or specialized contractors. EZ-Ox® can also be applied in wells, sumps and catch basins using filter socks to simplify application and monitoring, particularly in cases where treatment wells are also used for collection of ground-water samples. The application advantages of EZ-Ox® precludes the need for expensive application equipment or even subcontracted labor, which enables the design and implementation of relatively low-cost remediation programs. 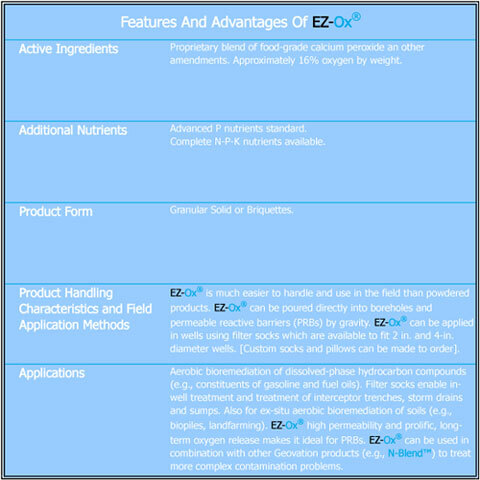 EZ-Ox® is designed to provide a sustained release of oxygen and nutrients (e.g., phosphates) to enhance the aerobic bioremediation of dissolved hydrocarbons. The high permeability of the EZ-Ox® granules provides greater contact with ground-water, which can flow through the product, instead around the concrete that forms from many powdered products. Because of the stability and permeability of the EZ-Ox® granules, EZ-Ox® socks dont swell, so that they are easy to install and remove in wells, over and over again. 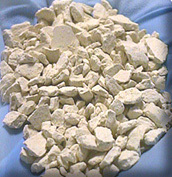 The permeability and unique chemistry of EZ-Ox® generates a prolific, long-term oxygen release. EZ-Ox® can establish super-saturated concentrations of dissolved oxygen (>20 mg/L), enhancing the diffusion of oxygen into the contaminated media, enhancing aerobic bioremediation processes. EZ-Ox® granules and briquettes are much easier to handle and apply in the field than powders. The permeability and unique chemistry of EZ-Ox® provides a prolific, long-term oxygen release.